Fast food is all about immediate satisfaction -- as such, you probably don't spend much time thinking about the effect it has on your body. 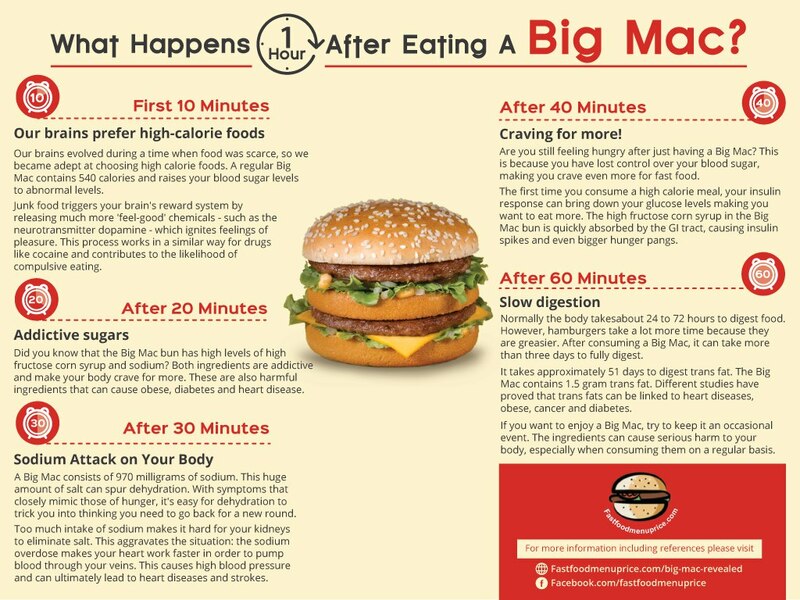 If this new infographic by Fastfoodmenuprice.com is to be believed, though, you totally should be thinking about it, because your body's response to ingesting a Big Mac is actually pretty gnarly. Surprising, right? The large quantities of high fructose corn syrup and sodium present in the Big Mac's bun trigger an addictive response in your brain, leading you to crave more. The sodium's not done yet, folks: those 970 milligrams of salt bring on symptoms of dehydration, which closely resemble those of hunger, leading you to believe you need even more Big Mac in your life. To make matters worse, your kidneys are forced to work even harder to process all that salt, and the corresponding heart rate increase leads to higher blood pressure. Those hunger cravings kick into high gear thanks to your body's inability to regulate blood sugar levels, with the high fructose corn absorbed by your gastrointestinal tract cause insulin spikes. Even once your body's normalized from the past hour's indulgence, your body can take upwards of three days to completely digest the burger due to its overwhelming greasiness. 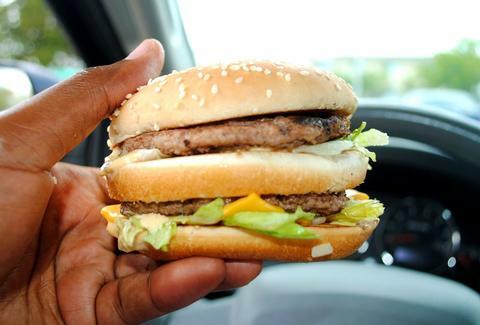 Before you swear off Big Macs forever, consider this: Yahoo Health showed the infographic's timeline to two nutritionists, and while they did confirm a lot of the findings, they spotted a few admitted exaggerations. While abnormal blood sugar and dehydration levels can definitely result from eating a Big Mac, the severity of those effects vary widely from person to person. Ultimately, though it's hardly a one-size-fits-all road map for health, the infographic should at least wake you up to what you already should've known from the get-go: Big Macs (and really all fast food) should be more of a once-in-a-while treat than a staple of your weekly meal plan.